Sean Rodriguez can play first base, which might give him an edge over Aaron Altherr for a roster spot. We’re less than a week away from meaningful baseball, Bryce Harper running to right field for the first time in a Phillies uniform, Questlove filling Citizens Bank Park with the wonderful aroma of his vegan cheesesteaks. Ahh, the season is near. But first, the Phillies have four more games in Florida before they fly north, and they have a few more roster decisions to sort out. There is still some work to be done in Clearwater. 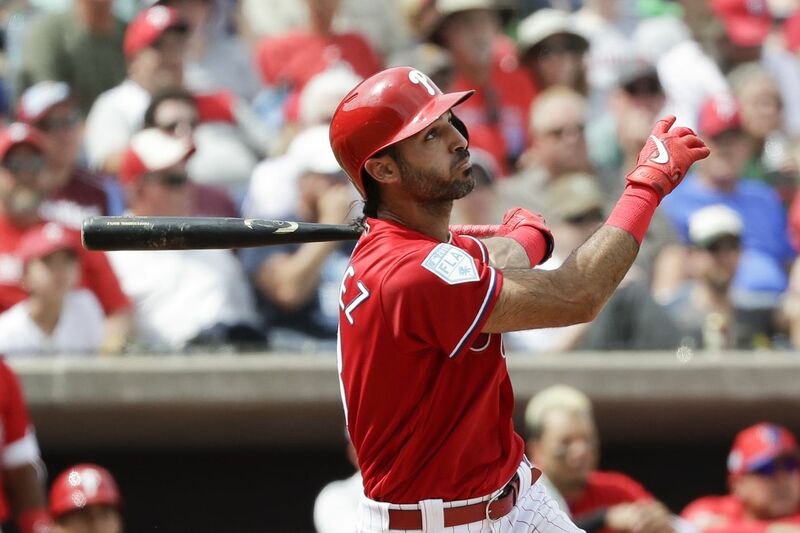 You’re signed up to get this newsletter in your inbox every weekday during the Phillies season and on Monday, Wednesday, and Friday mornings during spring training. If you like what you’re reading, tell your friends it’s free to sign up here. I want to know what you think, what we should add, and what you want to read, so send me feedback by email or on Twitter @matt_breen. Thank you for reading. Fans try to snag an autograph from Bryce Harper before a spring-training game. The Phillies made a few cuts Thursday, trimming their roster days before they board a chartered flight to Philadelphia on Monday night. One of those cuts, catcher Drew Butera, provided an indication that Andrew Knapp will enter the season as the backup catcher. So with that in mind, here’s one final roster prediction before everything comes into shape Monday. Starting rotation (5): Aaron Nola, Nick Pivetta, Jake Arrieta, Zach Eflin, Vince Velasquez. No surprises here after Drew Anderson was sent to minor-league camp. Velasquez might not start the season in the rotation, because the Phillies won’t need a fifth starter until the second week of the season. It does not seem likely that they will option him to the minors for the first week of games. Instead, the Phillies might use him in relief. Bullpen (8): Pat Neshek, David Robertson, Seranthony Dominguez, Juan Nicasio, Adam Morgan, Jose Alvarez, Hector Neris, Yacksel Rios. Tommy Hunter’s injury opened up a bullpen spot, which Rios deserves after a strong spring training. The other candidates, Victor Arano and Edubray Ramos, have struggled in camp. The Phillies will have two left-handers in Morgan and Alvarez plus a right-hander in Robertson who has had his way against left-handed batters. The bullpen, especially once Hunter returns, should be a strong unit. Starting lineup (8): Andrew McCutchen, Jean Segura, Bryce Harper, Rhys Hoskins, J.T. Realmuto, Odubel Herrera, Cesar Hernandez, Maikel Franco. The Phillies will field their best opening-day lineup since 2010; in 2011 and 2012, they were missing key regulars because of injuries. Manager Gabe Kapler, after using a collection of batting orders last season, plans to have a pretty consistent lineup in 2019. It’s easy to do that when the lineup is built around established hitters. Bench (4): Andrew Knapp, Scott Kingery, Nick Williams, Sean Rodriguez. The toughest decision here is Rodriguez over Aaron Altherr. Knapp is the backup catcher, Kingery is a utility player, and Williams is your fourth outfielder and first pinch hitter. If the fourth bench player is Altherr, the Phillies won’t have a backup at first base, a position that seemed to gain some importance this week when Rhys Hoskins was revealed to have a sore shoulder. Rodriguez can play every position except catcher, and Kapler said this about him earlier in camp: “One of the reasons we were excited about signing Sean is because I think he brought a level of fearlessness and toughness to camp that we needed.” The Phillies would have to add Rodriguez to the 40-man roster on Saturday, so we’ll know soon if it’s Altherr or Rodriguez. If it’s Rodriguez, the Phillies should be able to trade Altherr instead of simply designating him for assignment. It seems like Bryce Harper is finding his timing at the plate, Scott Lauber reports from Clearwater. Harper recorded his first hit on Wednesday and then followed that up Thursday by hitting a pair of home runs. “He showed why he’s one of the best offensive players in baseball,” Kapler said. Columnist Marcus Hayes talked to several Phillies about what type of heckling they hear from fans, after Russell Westbrook responded to a fan earlier this month at an NBA game in Utah. Roman Quinn heard racial slurs in New York, Pat Neshek said fans in Baltimore made light of a family tragedy, and Andrew McCutchen responded to a heckler in a unique way. It might be just spring training, but Vince Velasquez is not heading into a key season with much momentum. The Phillies are in win-now mode, Scott Lauber writes, so the margin for error is slimmer now for Velasquez. Drew Anderson will be at triple A after a great spring. Dallas Keuchel remains a free agent. Velasquez will have to earn his spot. Tonight: Jerad Eickhoff starts in Tampa against the Yankees, 6:35 p.m. Tomorrow: Phillies travel to Bradenton to play the Pirates, 1:05 p.m.
Sunday: Phillies host the Orioles in Clearwater, 1:05 p.m.
Monday: Last Grapefruit League game against the Rays, 1:05 p.m.
Thursday: Opening day in South Philly against the Braves, 3:05 p.m.
Phinley, the Clearwater Threshers mascot, watching the Phillies play the Astros in a spring-training game on Saturday. The Theshers are a minor-league affiliate of the Phillies. Alec Bohm, last June’s Phillies first-round pick, played in Thursday’s Grapefruit League game, his first taste of major-league spring training. The Phillies this spring have used their last five first-round picks: Aaron Nola, Cornelius Randolph, Mickey Moniak, Adam Haseley, and Bohm. The four first-round picks before Nola in 2014 are no longer with the Phillies, and three of the four are out of baseball. The Phillies will have the 14th pick in this year’s draft. Two possible selections: Arizona State outfielder Hunter Bishop and 6-foot- 6 West Virginia righthander Alek Manoah. Question: Who’s in the starting rotation in Lehigh Valley to start the year? — Geoff C, via email. Answer: We’ll know for sure this time next week, but my best guess has Drew Anderson starting the IronPigs season opener followed by these four: Cole Irvin, Jerad Eickhoff, Ranger Suarez, and Enyel De Los Santos. All those were in major-league camp this spring, and only Irvin has yet to pitch in the majors. The Phillies have some depth ready at triple A if a need arises, with Anderson being the first pitcher to be promoted. JoJo Romero, a lefthander, and Tom Eshelman, the organization’s pitcher of the year two years ago, might have to start the year at double A because of a numbers crunch, unless the Phillies start with a six-man rotation at triple A.